The 30,000 scientists and science graduates listed on the OISM petition represent a tiny fraction (0.3%) of all science graduates. More importantly, the OISM list only contains 39 scientists who specialise in climate science. In early 2008, the Oregon Institute of Science and Medicine (OISM) published their Petition Project, a list of names from people who all claimed to be scientists and who rejected the science behind the theory of anthropogenic (human-caused) global warming (AGW). This was an attempt to by the OISM to claim that there were far more scientists opposing AGW theory than there are supporting it. This so-called petition took on special importance coming after the release of the Intergovernmental Panel on Climate Change’s Fourth Assessment Report, and specifically the Working Group 1 (WG1) report on the science and attribution of climate change to human civilization. The WG1 report was authored and reviewed by approximately 2000 scientists with varying expertise in climate and related fields, and so having a list of over 30,000 scientists that rejected the WG1’s conclusions was a powerful meme that AGW skeptics and deniers could use to cast doubt on the IPCC’s conclusions and, indirectly, on the entire theory of climate disruption. And in fact, this meme has become widespread in both legacy and new media today. The OISM’s qualifications for being a “scientist” are expansive, and as such there are a number of questions that have to be answered before we can take this list seriously. What expertise does a nuclear engineer or a medical doctor or a food scientist or mechanical engineer have that makes them qualified to have an informed opinion on the cause(s) of recent climate disruption? How many of these names are working climate scientists instead of science or math teachers or stay-at-home-mom’s with engineering degrees? How many of these people has actually published a peer-reviewed paper on climate? How many people took a look at the card that served as a “signature” (click on the image to see a larger version) and realized that they could lie about having a science degree and their deception would never be discovered? At this point it’s literally impossible to know because the names and degrees on the list cannot be verified by anyone outside the OISM. We can only take the OISM’s word that they’re all real names, that all the degrees are correct, and so on. This does not stand up to the most basic tests of scientific credibility. Unfortunately, the OISM’s list has had its credibility fabricated for it by individuals and groups as diverse as Steve Milloy of Fox News (see this link for a S&R investigation into the background and tactics of Steve Milloy), L. Brent Bozell of conservative “news” site Newsbusters and founder of the conservative Media Research Center, Benita M. Dodd of the Georgia Public Policy Foundation, the libertarian/conservative site American Thinker (a site that has regularly failed to fact-check their AGW posts), conservative commentator Deroy Murdock (who works on Project 21 with the wife of one of Steve Milloy’s long-time associates), RightSideNews, Dakota Voice, Dennis T. Avery of the Hudson Institute, Lawrence Solomon of the Financial Post, Michelle Malkin, and the Competitive Enterprise Institute, to name just a few of the better known. As a result, the OISM’s petition has been elevated to a level of credibility that is arguably undeserved. While it’s not possible to test the validity of OISM list directly, it is possible to test the conclusions that have been drawn from the OISM list. Specifically, we can test what percentage the 30,000 “scientists” listed on the OISM petition represent when compared to the total number of scientists in the U.S. And we can then compare that to the percentage represented by the 2000 IPCC AR4 WG1-associated scientists as compared to the estimate number of U.S. climate-related scientists. According to the OISM website, anyone with a Bachelor’s, Master’s, or Doctorate of Philosophy in a field related to physical sciences is qualified as a scientist. In addition, the OISM sent the petition cards pictured above only to individuals within the U.S. Based on this information, we can us the OISM’s own guidelines to determine how many scientists there are in the U.S. and what percentage of those scientists are represented by the OISM petition. The U.S. Department of Education tracks the number of graduates from institutions of higher education every year, and has done so since either the 1950-51 or 1970-71 school years, depending on what specifically the Dept. of Ed. was interested in. This data was last updated in the Digest of Education Statistics: 2008. We’re specifically interested in the number of degrees that have been awarded in the various scientific disciplines as defined by the OISM in the list above. This information is available in the following tables within the 2008 Digest: 296, 298, 302, 304, 310, 311, and 312. Table 1 below show how many graduates there were in the various categories defined by the Dept. of Ed. since the 1970-71 school year (click on the image for a larger version). The numbers have been corrected to account for the fact that PhD’s will usually have MS degrees as well, and that both are preceded by BS degrees. As you can see, Table 1 shows that there were over 10.6 million science graduates as defined by the OISM since the 1970-71 school year. This is a conservative estimate as illustrated by the 242,000 graduates in biological and biomedical sciences from 1950-51 through 1969-70 alone, never mind the 166,000 engineering graduates, and so on. Many of these individuals are still alive today and would be considered scientists according to the OISM definition thereof. The OISM website lists how many signatures they have for scientists in each of their categories. Given the number of graduates and the number of signatures claimed by the OISM, we can calculate the percentage of OISM-defined scientists who signed as referenced to the total. These results are shown in Table 2 below. In other words, the OISM signatories represent a small fraction (~0.3%) of all science graduates, even when we use the OISM’s own definition of a scientist. However, as mentioned above, it’s entirely reasonable to ask whether a veterinarian or forestry manager or electrical engineer should qualify as a scientist. If we remove all the engineers, medical professionals, computer scientists, and mathematicians, then the 31,478 “scientists” turn into 13,245 actual scientists, as opposed to scientists according to the OISM’s expansive definition. Of course, not all of them are working in science, but since some medical professionals and statisticians do work in science, it’s still a reasonable quick estimate. However, it’s not reasonable to expect that all of those actual scientists are working in climate sciences. Certainly the 39 climatologists, but after that, it gets much murkier. Most geologists don’t work as climate scientists, although some certainly do. Most meteorologists do weather forecasting, but understanding the weather is radically different than understanding climate. So we can’t be sure beyond the 39 climatologists, although we can reasonably assume that the number is far less than the 13,245 actual scientists claimed by the OISM. 13,245 scientists is only 0.1% of the scientists graduated in the U.S. since the 1970-71 school year. We can, however, compare the number of atmospheric scientists, climagologists, ocean scientists, and meteorologists who signed this petition to the number of members of the various professional organizations. For example, the American Geophysical Union (AGU) has over 55,000 members, of which over 7,200 claim that atmospheric sciences is their primary field. The OISM claims 152 atmospheric scientists. Compared to the atmospheric scientist membership in the AGU, the OISM signatories are only 2.1%, and this estimate is high given the fact that the AGU does not claim all atmospheric scientists as members. The AGU hydrology group has over 6,000 members who call hydrology their primary field. The OISM list has 22 names that claim to be hydrologists, or 0.4%. The AGU ocean sciences group claims approximately 6,800 members. The OISM has 83 names, or 1.2%. And again, given that AGU membership is not required to be a practicing ocean scientists, this number is inflated. The American Meteorological Society claims over 14,000 members and the OISM claims 341 meteorologists as petition signatories. That’s only 2.4%. It’s clear that the OISM names don’t represent a significant number of scientists when compared to either the total number of science graduates in the U.S. or to the number of practicing scientists who work in likely relevant fields. But that’s not all. Over recent years, various organizations have set out to estimate just how widespread the supposed “scientific consensus” on AGW actually is. Two recent efforts were conducted by the Statistical Assessment Service (STATS) at George Mason University and by the Pew Research Center for the People and the Press. The STATS survey found that 84% of climate scientists surveyed “personally believe human-induced warming is occurring” and that “[o]nly 5% believe that that human activity does not contribute to greenhouse warming.” The STATS survey involved a random sampling of “489 self-identified members of either the American Meteorological Society or the American Geophysical Union” and it has a theoretical sampling error of +/- 4%. The Pew survey was taken in early 2009 and asked over 2000 members of the American Association for the Advancement of Science (AAAS) their opinion on various scientific issues, including climate disruption. 84% of AAAS respondents felt that “warming is due to human activity” compared to only 10% who felt that “warming is due to natural causes.” The AAAS has over 10 million members, and the results of the survey are statistically valid for the entire population with a theoretical sampling error of +/- 2.5%. 84% of 10 million scientist members of the AAAS is 8.4 million scientists who agree that climate disruption is human-caused. 84% of the climate scientists (conservatively just the members of the atmospheric science group of the AGU) is, conservatively, 6,000 scientists who have direct and expert knowledge of climate disruption. The 13,245 scientists and 152 possible climate scientists who signed the OISM petition represent a small minority of the totals. The IPCC AR4 WG1 report was written and reviewed by approximately 2000 scientists. If we assume that the 20,000 AGU members who claim to be atmospheric scientists, ocean scientists, or hydrologists represent the pool of potential experts in climate science in the U.S., then approximately 10% of all climate scientists were directly involved in creating the over 1000 page report. That compares to less than 1% of all OISM “scientists” who mailed a pre-printed postcard. A more recent survey of earth scientists asked the question "Do you think human activity is a significant contributing factor in changing mean global temperatures?". 97.5% of climatologists who were actively publishing papers on climate change responded yes. (Doran 2009). What is most interesting about this study was that as the level of active research and specialization in climate science increases, so does agreement that humans are significantly changing global temperatures. Ultimately, The OISM petition will continue to rear it’s ugly head until its fabricated credibility has been thoroughly demolished. Social conservatives and libertarians, each of which has their own ideological reasons to push the OISM petition, have been effective at keeping the “30,000 scientists reject warming chicken-littleism of IPCC” meme circulating throughout conservative media outlets, even as climate disruption-focused media have worked at limiting the damage from the OISM petition. But given the fact that the science supporting a dominantly anthropogenic cause for climate disruption is overwhelming, it’s only a matter of time before the OISM petition wilts in the heat. Acknowledgements to Brian Angliss at Scholars and Rogues who guest wrote this post. I've posted this before but I haven't seen the point understood yet. The actual wording of a major part of the petition is so constructed that even fully legit climatologists - even James Hansen - could happily sign it. There is no convincing scientific evidence that human release of carbon dioxide, methane, or other greenhouse gases is causing or will, in the foreseeable future, cause catastrophic heating of the Earth's atmosphere and disruption of the Earth's climate. The weasel wording is "is causing or will", which are 100% definitive statements (there's no probability in them). Catastrophic heating/disruption is by no means certain so the average pernicketty scientist could sign with a clear conscience. This paper addresses both the ones you quote, and I think it is important for SkepticalScience readers to get the full picture since it was published the same day! Notice how the word "comment" is in the title? You have to be careful with your language when using words such as 'refute' and 'challenged in the peer-review literature' when informing the readers on SkepticalScience as it is highly speculative language. If a new survey and hence a new paper was performed with results contrasting Doran and Zimmerman then you could say 'challenged in the peer-review literature'. At the moment all you can say is their are two published criticisms of the paper, and that the author replied to these. With your actual concerns over the survey, that the two critics made, the EOS is behind a pay wall so it would be difficult to discuss the actual contents and author's reply further unless somebody with a subscription can access the content. Also where do you get the number from Doran 2009 that 567 Scientists Surveyed do not believe man is causing climate change? Censorship and manipulation of data and careers does too. But here it's way more than 1, it's 10's of thousands of rational educated professionals in opposition as the (correct) minority. They laughed at Galileo. They laughed at Newton. But they also laughed at Bozo the Clown. I don't intend this as an ad-hominem attack on your friend (whom I've presumably never met), just a general observation. The odds are that anyone who thinks they're a second Galileo is probably suffering from an extreme case of Dunning-Kruger. DrTom you should prioritize friendship. Ned mentions laughter and as an MD your friend ought to know laughter is indeed sometimes the best medicine. Try steering him to DenialDepot which may actually succeed in provoking some thought on the whole matter. "The IPCC AR4 WG1 report was written and reviewed by approximately 2000 scientists." - needs a link, given rebuttals such as this. Too much attention spent focusing on how many people theoretically could have signed it. Saying there are 10M science grads since 1970 isn't any sort of refutation. Broken link to the 2009 Pew survey. Tristan: "Too much attention spent focusing on how many people theoretically could have signed it. Saying there are 10M science grads since 1970 isn't any sort of refutation." There's nothing to refute. What argument does the petition make? The only arguments that the petition makes are that "strength is in numbers" (bandwagon) and "undergraduate science degree = universal scientific expert" (false authority). If an audience exists for these arguments, then an analysis of the strength of the arguments is relevant and in order. A useful counter to such moves is the analysis of strength, in this case showing that an impressive number like 31,000 is pretty weak when set against the maximum number who could have signed. The stronger criticism (of the false authority) won't work in this case, because the target audience won't be willing to spend the time to consider the actual authority represented in the 31,000 (or they would have already done it intuitively). It's fairly clear that the 31,000 argument is designed for people who don't have the motivation to even open the cover of climate science basics. To make such an argument is to express a desire to shape the opinion of these people without providing them with the critical context (and the petitioners have been reticent regarding methodology) necessary for making ethical choices. Using the 31,000 argument says a lot more about the integrity of the user than it does about climate science. Reading anything about climate science from the results of the petition says more about the critical ability of the reader than it does about the truth of the petition. Assigning the maximum possible denominator to the 32000 and saying 'look how small it is' is almost as bad as saying '32000 is a really big number!'. Tristan, what is useful about the estimate of opinion of a bunch of non-experts? Tristan: "Assigning the maximum possible denominator to the 32000 and saying 'look how small it is' is almost as bad as saying '32000 is a really big number!'." I agree, but unfortunately the original argument was made, and it has to be addressed, and it has to be addressed with the audience-appropriate logic (as "bad" as it is). The people who accept the "over 31,000" argument (as silly as it is) will be forced to accept the "10 million" number, or else they'll be forced to recognize the silliness of the "over 31,000" argument. Tristan: "What would be far more relevant would be an estimation/examination of the petition's distribution and a discussion about why 32000 signatories isn't of itself, a useful estimate of opinion." Again, would you expect anyone who accepts the "over 31,000" argument to be willing to do or read what you suggest? I guess I just can't abide the idea of audience appropriate logic, especially when it's under the heading 'intermediate'. Of all the nonsense spewed by deniers, this one is certainly one of the most ridiculous. "There is no scientific consensus." Since it's quite easy to show that, in fact, there is one, this is often followed by "science is not done by consensus" with all manners of misundertanding what scientific consensus actually is. Attempts to correct the misunderstanding by pointing that consensus follows from the science instead of preceding it usually falls on deaf ears. This in turn, is often followed by arguments like the stupid petition thing, portraying a consensus of opinion among non experts as a valid one, right after insisting that consensus among experts is not. When emotionally charged, ideology driven opinion puts up its defenses, there is no amount of rational thinking that can tear them down. 1. Those who hold science degrees (and in particular undergraduate degrees only) are probably clueless in many areas of science. 2. What is the basis of the signers' expertise? 3a. If 32,000 is impressive, and I find 32,000 people who think you should die, will you kill yourself? 3b. If I find 32,000 atheists who say you should worship the Flying Spaghetti Monster (praise its name), will you? 3c. If I find 32,000 science majors who think the Earth is 6000 years old, will you then believe the Earth is 6000 years old? 3d. If I find 32,000 English majors who say that Joyce's Ulysses is the greatest work of fiction in English, does that settle the matter? 4. If I create a petition that says the opposite, and I get 32,001 signatures from science majors, are you forced to believe my petitioned claim? 5. What happens if all of these 32,000 change their minds? Does your mind change as well? What if these 32,000 are then replaced in a new petition by a different set of 32,000? Will you short-circuit? 6. If 32,000 climate scientists put their expertise up against that of 32,000 science majors, who would be right about issues within climate science? Here you see that the maximum number is important. If I ask, "If 100 of the most-published climate scientists put their expertise up against that of 32,000 climate scientists, who would be right about issues within climate science?" then the denominator is critical, because I could bring it down to 1 vs. 32,000. It's all goofiness designed to prey upon people who, again, do not have the time, means, energy, training, and/or motivation to come to an understanding for themselves--or designed to confirm what we already suspected, the Great GW Hoax! Tristan @10, the petition was originally circulated to "virtually every scientist in every field" in the US according to one of its critics. But the OISM refuses to indicate the size of the mailout. Arthur Robinson, president of the Oregon Institute of Science and Medicine, the small, privately funded institute that circulated the petition, declines to say how many copies were sent out. "We're not willing to have our opponents attack us with that number, and say that the rest of the recipients are against us," he says, adding that the response was "outstanding" for a direct mail shot. " The original mail out only garnered about 15,000 responses. Despite Robinson's claims, without a precise statement of the mail out number, no significance can be assigned to the petition as a survey of scientific opinion. What is more, given the anecdotal evidence of the size of the mailout, and the small size of the respondents (15,000) compared to the number of "virtually every scientist in every field", the reasonable conclusion is that the response rate was very small. Indeed, if it were not, you can be sure that the OISM would be trumpeting not only the absolute number of signatories, but the response rate as well. Since the original mail out, the petition has been available online to add the signature, and has been frequently trumpeted by various political figures, so its presence has been known. Given that, the response rate is best given by the number of signatories divided by the number of potential signatories as given in the main article, ie, 0.3%. As such, this petition is no more significant than any of the various creationist petitions that get circulated. Indeed, given the close ties of the OISM and the Discovery Institute (an Intelligent Design creationist site), it can be viewed as one of the various petitions circulated by creationists. Contributors and Reviewers of the IPCC WGI Fourth Assessment Report, but there can't be too far off 2000 names there, can there ? Anyone care to count...? when soliciting money, a response of 2% was often thought of as the gold standard. If one is not asking for money, then a response rate in the double digits is probably a reasonable standard if the solicitation is written clearly enough. I've received response rates as high as 10% for complex questionnaires. With those thoughts in mind, the (estimated) .3% response rate to the OISM mailing is --wow -- friggin' awful. They didn't even ask people to send money and they got only three tenths of a percent to agree? That is only a tenth of the percent of climate scientists (3%) who either dispute or have no opinion on the majority consensus on global warming. I'd love to have the mailing list of this 31,000 people. I could publish all kinds of drivel and sell it to them for a profit. Response: TC: All caps changed to bold to comply with the comments policy. The comments policy contains tips on the use of html tags for emphasis so that future comments can comply. It's worse than that, Bill. All that was needed was a BSc degree in some field arguably generally related to climate. It's probably safe to say that most of the signers probably aren't actually working in the sciences. Peter Hadfield AKA potholer54 has a good video on that. Gee, I never knew it was so easy to write off 30,000 people's opinions as being meaningless. You'd think it would at least cool the sanctimonious rhetoric about 97%. likeithot... No one writes off the opinions of 30,000 people. It just happens to be an extremely low figure once you put it into context. The 30k figure is a subset of some 30 million people who fit the definition of the petition. Once you add the denominator you find that 30k is a very tiny number. Once you refine the standards and focus on actual expertise in the subjest of climate change, then you find that 97% agree that humans are changing the climate primarilty through the emissions of CO2. The article I cited explains clearly how the standars were "refined" with a clearly pre-meditaded (+unscientific) political adgenda. Do you not feel that the OISM Petition Project has "a clearly pre-meditaded (+unscientific) political adgenda"? I note elsewhere on this website you protest that your questioning went unanswered. With that sensitivity in mind, I would answer your question @21 by pointing out that the "someone" is surely the GWPF who certainly require a reality check. To publish that propagandist and scurrilous nonsense from Andrew Montford is, for an organisation registered as a UK educational charity, bringing the UK Charity Commission and the numerous legitimate charities it supports into disrepute. Just a psychologist so I'm sure I don't count here, but I do know something about people and the herd instinct which I think is working here to a large extent. There is also, I am not a theologist, some evidence of the sin of greed. So many billions of dollars changing hands over a theory, really just a theory which looks more like a religion since you can't oppose it without retribution. Wise men should be skeptical. I am quite relaxed about the climate getting warmer, I like summer better than winter, don't you? The people with coastline properties are probably those terrible "rich" people anyway whom we have all been told are sucking on our vital juices for their own benefit. Terrible people. [Dikran Marsupial] Welcome to SkS (psychologists are most welcome). Please take time to read the comments policy, SkS is intended to be a site for productive discussion of climate science and closely related topics, but it is not a forum for the sort of trolling that is all too common on climate blogs. Further comments of this nature will be deleted. If you disagree with the mainstream position on climate science, then I would encourage you to pick a specific argument (see the list of climate myths on the bar to the left) and explain your objection clearly. I'm sure you will find plenty of people here willing to discuss the science with you in a rational and friendly manner, provided that you behave in a similarly mature manner. It can be said that being "quite relaxed about the climate getting warmer" puts you in good company. Some eminent climatologists have also reached that conclusion. Svante Arrhenius (often credited with discovering AGW) and GS Callender (AGW was called the Callendar Effect once-upon-a-time) both thought the world would benefit from warming. Arrhenius (or perhaps a colleague of his) even toyed with the idea of setting fire to coal mines to help it on its way. Then if you live in chilly Sweden you probably would think 'warm' was 'good'. And I'm told it can be nippy in Sussex during an Ice Age, which was Callendar's concern. Of course, both are now long dead so their views on the outcome of AGW are a particularly outdated. So maybe they are not such "good company" after all. BarbaraB... The challenge here is that it's a little more complex than things just getting a little warmer. A small increase in global mean temperature actually increases the number of hot and extreme heat days per year, which can have strong negative impacts on crop production. Then you have to add in what's known as arctic amplification, where the poles heat up faster than the equator. Consider how challenging it is today, with good crop production, to feed 7 billion people on this planet. Up that number to 9 billion and throw in reduced crop production, now you have the recipe for political unrest, wars, and refugees attempting to escape those conditions. Suddenly, a little bit of warming becomes a very big problem. Rob, In my neck of the woods - upper USA midwest - the issue is more about higher low temps and the consequent higher humidity levels (I gather). I was speaking with a climate scientist just last week at a an informal meeting and he has been evaluating extreme (2.0+") spring rainfall events. Six of the last seven years (May-June period) have been outside the 95% probabillity ellipse of a dataset that is approx 104 years old. We all know the likelihood of that randomly occurring. These more frequent, and larger spates play out in many negative ways, not the least of which is translocation of soil down the MS River. There are some serious implications here for ag management (e.g. nutrient application, riparian management) if this trend continues. I believe he said the temps coming from Canada have been 6 F warmer, as opposed to the 0.5 F warmer from tropical influences. I can't remember the time frame he was mentioning. This isn't my area of research, but it clearly is unsettling to this old ecologist. Not even linking the petition in question makes your article risible. Thank you for proving to everyone how unscientific this website is. jesse_a_b @29, do you mean to say that the second link in the intermediate article does not work for you? Or are you merely proving how scientific you are by criticizing based on false, and easilly falsified information? jesse... Top of the page, it's right there in red letters that say "OISM." We'll now be expecting an apology and an enthusiastic endorsement from you regarding this very scientific website. the blue link titled "OSIM Petition" leads directly back to here. The red "OSIM" caption does in fact lead to the petition. Since you normally provide links that are blue, his confusion is understandable. franklefkin @32, jesse_a_b may have been merely confused, missing not one, but two links to the petition and that would have been understandable had they merely asked where the link was. Instead of asking, they described the article as "risible", and decried the absence of a link (of which there were two) as "proving to everyone how unscientific this website is". An apology is well in order, as also the retraction of the unwarranted opinion about the quality of this website. I've been following the climate change issue for some time and although This petition does not hide their academic degree list of signatories or their fundamental argument against AGW. They do have peer reviewed research papers giving details if anyone that reads this site is actually interested. I'm not a climate scientist I watch a lot of the skeptics like Dr Roy Spencer and John Christy who seem very well informed. I've never watched a NASA climate scientist speak out so I checked and I found that NASA is a executive government agency and the climate scientists are told to NOT discuss their views publicly (so we actually don't know how many NASA scientists are skeptics). I've also watched a lot of deceit and data manipulation from major players like IPCC (Climategate) and NAOO (2015 data manipulation). I’ve read these reports and I think all this is common knowledge as these events are in Wikipedia if references are necessary. [PS] Perhaps try expanding your reading somewhat (here is a good place) and showing some real skepticism (ie critically examine your anti-AGW sources as well as published science). Your statement contains numerous errors. Please see the Intermediate version. FYI: NASA scientists discuss their work publicly quite often. Look around a bit on the GISS website--all sorts of outreach, communication, and transparency. Compare the professionalism of NASA's scientists and programs with that of Spencer and Christy (who told Congress in 2013 that no warming had occurred in 15 years, contradicting his own data and laughably contradicting the trend in atmosphere+ocean heat content). Your choice, though. While it's only human to root for the underdog, the underdog overwhelmingly has a losing record. Those moments when the underdog actually wins are spectacular and memorable. In this case, the underdogs are not actually working together on the science. The "skeptics" have various alternative theories that are neither comprehensive nor cohesive. Arrayed against the underdogs is a collection of evidence built over 150 years and through hundreds of thousands of tests, both experimental and applied. The underdogs in this case, like so many others, are slowly being ground beneath the clinking treads of scientific understanding. Join them, if you will. Or start asking questions, engaging the ideas, and considering the evidence as objectively as you can. [PS] The statement "I found that NASA is a executive government agency and the climate scientists are told to NOT discuss their views publicly (so we actually don't know how many NASA scientists are skeptics)." would seem to imply that jmcookie think there is a govm't directive to promote AGW, silencing any opposition. This nefarious operation must also extend to climate research in every other country in world. Frankly, I think jmcookie would be more at home with the conspiracy theorists at WUWT rather than here. Hi. I've been visiting SkS for some time now and generally find the explanations of the science of CC a useful balance of technical detail with layperson language. The filtering by knowledge level is a novel and useful tool (I usually read all levels!). I've been exploring the topic of consensus and the flip-side, denial. So I've just read both Cook et al 2016 and the "petition paper" by Robinson et al (both of which are linked to in your article but at which I arrived quite indepently). It is clear from reading Cook et al and your article above the value of understanding who is providing the opinions. Cook et al finds that the higher the level of expertise in climate science, the greater the level of consensus. Analogies of getting a heart condition checked out by a motor mechanic are relevant when comparing the findings of Cook et al (ie 97% of expert climate scientists agree that climate change is caused by human activity) versus the OISM petition, signed predominantly by non-climate, possibly non-practising, unpublished, general scientists. So it is useful that you and other websites, notably the Huffington Post (http://www.huffingtonpost.com/kevin-grandia/the-30000-global-warming_b_243092.html) have tackled the credentials of both the signatories and the creators of the petition and Robinson et al paper. Thank you. However, I think it would also be useful to tackle the paper itself. Climate change is bewildering to non-scientists, and when one comes across a paper as apparently credible-seeming as the Robinson et al paper, it is difficult for a non-scientist to sort the credible science from the rubbish. Robinson et al's theory about solar irradiance looks pretty good on the graphs, and the longer-term fluctuation in earth's temperature also makes our current increases look pretty modest. So I've done just enough preliminary digging into those aspects to convince myself that the Robinson et al paper is at best incomplete in its presentation of evidence (for instance, this webpage about solar irradiance http://solar-center.stanford.edu/sun-on-earth/glob-warm.html), and in reality, deliberately misleading. Yes, go ahead and expose the poor credentials or vested interests of those with opinions that contrast the majority view or have a disporportionate influence, but we need to not simply write-off everything that those people say as rubbish simply because of those credentials or interests. The discrediting of those views should also be focused on the validity or otherwise of their scientific claims, backed up with credible science and analysis. I think it is far more powerful to expose the errors or holes in their arguments than to simply call them fraudulent. You have all the relevant science within this site. I suggest that it would be a useful counter to the OISM petition and paper for you to list the scientific claims made in the paper and provide links to the relevant science or other references as you did with the list of studies on consensus. Then your debunking of the petition and paper would not need to rest on the absurdity of the perceived size of 31000 signatories as a representative sample. Kirdee, I couldn't agree more. I have been waiting patiently for the actual scientific rebuttal to the paper. As easily as the information is laid out, I would have thought that a point by point tearing apart of the data and sources used would have come quickly. Deaner @38, and Kirdee @ 37, you may be waiting a long time for a detailed rebutal of the accompanying paper to the OISM petition. That is because the paper constitutes a Gish gallop. It is so dense with cherry picks, data taken out of context and other errors that it would take a paper just as long simply to provide links to related rebutals. Given that all of the claims can be (and have been rebutted on SkS) in relation to other issues, the time that would be involved in tracing down all the references, and composing a rebutal is not sufficiently well rewarded. To give you an idea of what I mean, I will consider just a few claims made by the paper. It is a real proxy, and I do not know of any problems with Keigwin (1996). What I do know (and which should be obvious) is that no proxy from a single location is a proxy of global temperature. To think it is is as absurd as thinking that temperatures in Darwin, Australia must vary in sync with those of Boston, Massachussets. Because temperatures in different regions do not vary in sync, when taking a global average they will regress towards the mean. Large variations will be evened out, and global mean temperature peaks (and troughs) are unlikely to coincided with peaks (and troughs) of individual regions. "The average temperature of the Earth has varied within a range of about 3°C during the past 3,000 years. 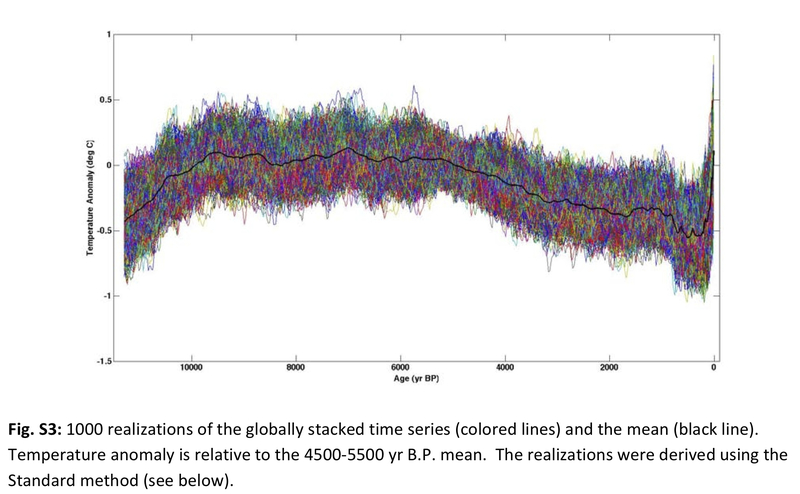 It is currently increasing as the Earth recovers from a period that is known as the Little Ice Age, as shown in Figure 1. George Washington and his army were at Valley Forge during the coldest era in 1,500 years, but even then the temperature was only about 1° Centigrade below the 3,000-year average." RRS have created an entirely false impression by using clearly inadequate, and cherry picked, data. You will notice that RRS show the figure inverted. 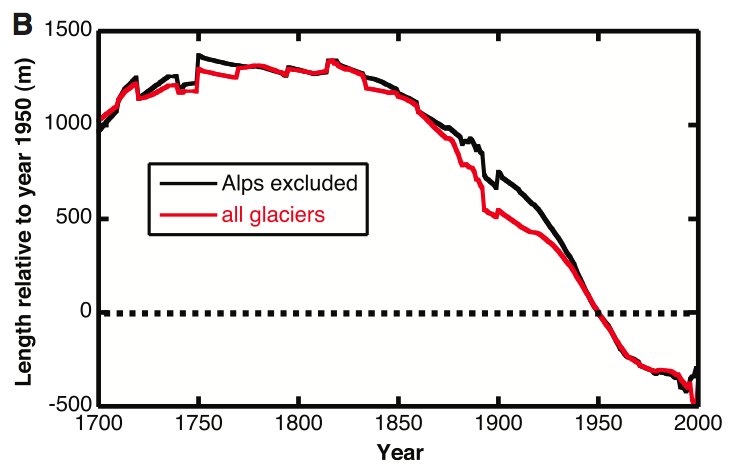 You will also notice that while the all glaciers figure (in red) jogs down towards the end, it is only the "Alps excluded" figure that jogs up at the end, as shown (once allowing for the inversion) by RSS. From that evidence, they have deliberately chosen the more restricted data, and chosen it because it better fits their narrative (because it is smoother). Temperatures are seen to be more or less stable from 1600, with the slight rise starting around 1850 in keeping with what has gone before. The 20th century, however, is marked by an unprecedented, rapid, rise in temperature. That has lead to an unprecedented and rapid retreat of glaciers. Once again RRS create a false impression by cherry picking the data, and by forcing us to rely on an intuitive, but false understanding of the relationship between glacier length and temperatures (which are modulated by slope and precipitation, factors Oerlermans takes into account but for which we have no information). Worse, they portray the data from approximately 70 glaciers (ie, the total number of glaciers used excluding those from the Alps) as though it were the full 169 glaciers considered. I could go on, but you will already see from my brief treatment of just two points how extensive a full treatment of RSS would be. You will also have noted the dishonest tactics used repeatedly by RSS in their paper. Tom Curtis @39 , your first graph of local Sargasso Sea surface temperature proxies, taken from Keigwin, has already been "doctored" by Robinson and associates. In ThinkProgress , May 22nd 2012, physicist Mark Boslough relates how Keigwin's original graph had been shorn of "several years of modern measurements at hydrographic station "S" in Bermuda, starting in 1954" (measurements which presumably Keigwin had thought a good modern comparison for the nearby Sargasso proxies) — and these hydrographic measurements were making the denialist case look less impressive. In a further enormity, they had added a spot temperature of 23 degrees at the end of the graph — an addition which strengthened the denialist "impression" for the casual reader. Boslough says the correct figure for that 2006 spot, should be a full degree higher (i.e. 24). He brought the error to their attention. And they refused to acknowledge or correct it. Eclectic @40, the original Station S SST data as shown by Keigwin (1996) Figure 3, is published here. The data is annual data from 1955 to 1995, with a mean of 23.025 C, a Standard Deviation of 0.2981 C, and a trend of 0.05 +/- 0.08 C/10 years, as determined by simple linear regression. More recent temperature data (ie, from late 1988 to the end of 2015) can be found here as Hydrostation_S CTD data. That data comes as profile, with 22 individual profiles over the course of 2015 (and presumably similar numbers for earlier years). I did not think it worth to the trouble to download 22 seperate files to determine an annual average, but 2015, at least, appears to have a mean around 24 C.
From this I would say it was perfectly reasonable to use 23 C as the modern value, but the end of the chart should have been marked as 1975 (the mean of the years of modern data). Clearly if you do use 2006 rather than 1975 as the final value, the modern value would be closer to 24 C than to 23 C. Using a fifty year mean (1957-2006) would lower the data point to just above 23 C, and would be perfectly valid given that the data from the d18O is presented as fifty year means. Given the scale of the graph, it is not possible by visual inspection to determine whether or not the final d18O data point is 1950 (as it should be). Overall, I disagree with ThinkProgress about the termination of the graph (which is clearly before 2000). I agree about removing the modern data, but think it a minor point. I definitely think that the "modern value" shown should be labeled 1975, given that it appears to be the mean of the instrumental values in Keigwin (1996). As it is labelled "2006, it should show a temperature much closer to 24 C. Whether RRS should be considered to have incorrectly labelled genuine modern data, or incorrectly placed correctly labelled data is indeterminate; but in either case they have straightforwardly strengthened the case they are trying to make by misrepresenting the data. Thankyou for bringing that to my attention. The blog seems to attack common weaknesses of both realists and alarmists. The alarmist assertions, from ambiguous questions, are a commonality. I addition, the % of survey targets delivered a tiny number of respondants. Consensus is irrelevant as all scientists should know however, it has been clearly assessed by Von Storche etc, that the relationship between alarmists, the media and consensus in the unqualified dogma of the masses, is a self perpetuating myth. This blog, so far, contributes to the mythology. [PS] Sloganeering snipped. Please read and abide by comments policy. This is not optional. Furthermore note that noone claims scientific consensus make the science right, only that the scientific consensus is the only rational basis for policy. If you want dispute something, use appropriate language. Clearly state the claim (with a reference) you dispute so dont have any strawman arguments. Back your criticism with references/data preferably from the peer-reviewed literature. If you just want a rant there are plenty of other forums which welcome such contribution.